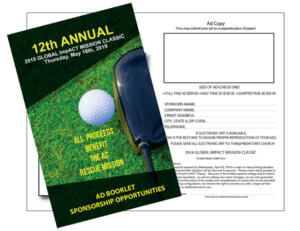 Through our partnership with The Atlantic City Rescue Mission, your participation in this year’s ImpACT Classic will help meet the physical and emotional needs of those who need a hand up and some who are bound and bruised by addictive lifestyles in Atlantic City and the surrounding communities. 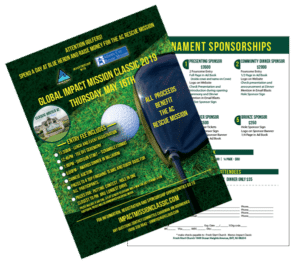 By sponsoring or playing in the 2019 Global ImpACT Mission Classic, your contributions will be making a direct IMPACT in the lives of those at the Atlantic City Rescue Mission. Prizes to 4 top finishing teams and Goody Bags for all Participants. Prizes include: a gas grill, a flat screen television and a new car just to name a few. additioanl prizes will be announced via social media. Cost includes; Lunch for 12:00 to 1:00 pm, Dinner & Award Ceremony, Scramble Format, Contest On Course. Register using the button below. Registration is processed through the Blue Heron Pines Golf Club. DON’T GOLF? NOT A PROBLEM. Community Dinner Sponsor – $2000 ● Foursome Entry, 1/2 Page in Ad Book, Logo on Website, Check presentation and announcement at Dinner.